About Good	 The grade AG-3. The grade for a coin that is just below good. On an About Good coin, only the main features of it are present. Date, mintmark, peripheral lettering, or other features sometimes are partially worn away. About Uncirculated	 Alternate term for Almost Uncirculated. Abrasions	 Areas of a coin where another coin or a foreign object has displaced metal in an abraded fashion. Accumulation	 1. A grouping of a particular date, type, or series. Example: an accumulation of Morgan Dollars. 2. A random grouping of coins, often as a monetary hoard. Opposite of a coin collection. Adjustment marks	 Scratches which appear mostly on pre-1807 silver and gold coinage. These scratches are actually file marks, made at the mint in order to reduce the weight of a coin so that its metal value wouldn’t exceed its face value. As a rule, adjustment marks do not reduce the value of a coin nearly as much as a series of equally visible scratches, which were not “mint-applied”. AG	 Acronym for About Good. Album friction	 A less severe instance of album slide marks. Album friction shows as slight rubbing on the high points. Album slide marks	 Lines (often parallel) imparted to the surface of a coin by the plastic “slide” of an album, mostly found on proof coins. Alloy	 A combination of two or more metals. Almost Uncirculated	 The grades AU50, 53, 55, and 58. These coins often look Uncirculated at first glance, but closer inspection will reveal slight friction or rub. Altered surfaces	 Cleaning or other impairment that renders a coin less desirable to collectors. Alteration	 A coin that has a date, mintmark, or other feature that has been altered, added, or removed, usually to simulate a rarer issue. ANA	 American Numismatic Association, the world’s largest organization of coin collectors and dealers. It is a non-profit organization, chartered by an Act of Congress in 1912. Membership is highly recommended. If you are not a member, you should be! Write to them at: 818 N. Cascade Ave., Colorado Springs, CO 80901. ANACS certificate	 A uniquely numbered opinion of authenticity and/or grade from the ANA Certification Service. ANACS	 American Numismatic Association Certification Service originated by offering authentication, and later provided grading services. The grading service and acronym were sold by the ANA and now operate under this name as a third-party grading service. Ancients	 Term for coins of the world struck circa 600 B.C. to circa 450 A.D.
Annealing	 The heating (and cooling) of a die or planchet to soften the metal before preparation of the die or striking of the coin. Anvil die	 The lower, stationary die. The reverse is usually the anvil die, although on some issues with striking problems, the obverse was employed as the lower die. Because of the physics of minting, the fixed lower-die impression is slightly better struck than the upper-die impression. Arrows	 Design element usually found in the left (viewer’s right) claw of the eagle seen on many US coins. Arrows and rays	 Term referring to 1853 quarters and half dollars. The rays were removed in 1854 because of striking difficulties created by the busy design. Arrows at date	 Term referring to the arrows to the left and right of the date. These were added to the dies to indicate a weight increase or decrease. Artificial toning	 Color added to the surface of a coin by heat and/or chemicals. Attributes	 The elements that make up a coin’s grade. The primary attributes include marks (hairlines for Proofs), luster, strike, and eye appeal. AU	 Acronym for About (Almost) Uncirculated. Auction	 An offering of coins or other items for sale where the buyer must bid against other potential buyers with no set price. This is in contrast with ordering from a catalog, price list, or advertisement at an advertised price. Authentication	 The process of determining genuineness. Bag	 A generic term for the cloth sacks used to transport and store coins. These came into use in the mid-nineteenth century and replaced wooden kegs. Also refers to the quantity of coins of a particular denomination found in a bag (such as 5000 cents or 1000 silver dollars). Bag marks	 Abrasions which occur on coins that were shipped in mint bags. Most often this term applies to silver dollars, although virtually any coin can have bag marks. Bag marks in no way mean that a coin is not mint state. In fact, even a coin graded Mint State-67 or higher could have some bag marks. Bag toning	 Coloring acquired from the bag while a coin was stored. Cloth coin bags contained sulfur and other metal-reactive chemicals. When stored in bags for extended periods, coins in close proximity to the cloth often acquire beautiful red, yellow, blue and other vibrant colors. Sometimes the weave of the cloth is visible in the toning. Some coins have crescent-shaped toning because another coin was covering part of the surface, thus preventing toning. Bag toning is seen most often on Morgan silver dollars. Barber coinage	 Common name for the Charles Barber designed Liberty Head dimes, quarters, and half dollars struck during the 1890s and early 1900s. Basal state	 The condition of a coin that is identifiable only as to date, mintmark (if present), and type; one-year-type coins may not have a date visible. Basal value	 The value base on which Dr. William H. Sheldon’s 70-point grade/price system started. The lowest-grade price was one dollar ($1) for the 1794 large cent - upon which he based his system. Basining	 The process of polishing a die to create a mirrored surface or to remove clash marks or other damage from a die. Beaded border	 Small round devices around the edge of a coin, often seen on early U.S. coins. BG Gold	 Term sometimes applied to California fractional gold coins as documented in the Breen-Gillio reference work California Pioneer Fraction Gold. Bid	 The highest price offered to buy a particular coin issue and grade either on a trading network, pricing newsletter, or other medium. Bidder	 1. A dealer issuing a quotation on an electronic trading system. 2. A participant in an auction. Blank	 A flat disk of unstruck metal destined to be made into a coin. BN	 Short for Brown; refers to copper coins. Body bag	 Slang term for a coin returned from a grading service in a plastic sleeve within a flip. The coin referred to is deemed a “no-grade” and is not graded or encapsulated. Coins are no-grades for a number of reasons, including questionable authenticity, polishing, cleaning, and/or repair. Bourse	 The Paris stock exchange. This term has come to be synonymous with coin show. Bourse floor	 The physical area where a coin show takes place. Braided Hair	 Style of hair on half cents and large cents from 1840 on. The hair is pulled back into a tight bun drawn with a braided hair cord. Branch mint	 One of the various subsidiary government facilities that struck, or still strikes, coins. Breast feathers	 The central feathers of eagle designs, particularly Morgan dollars. Fully struck coins typically command a premium and the breast feathers are usually the highest point of the reverse. Breen	 The late Walter Breen. Breen Book	 Slang for Walter Breen’s Complete Encyclopedia of U.S. and Colonial Coins. It was published in 1988. Breen letter	 A written or typed document by Walter Breen rendering his opinion on a particular numismatic item. Prior to 3rd party certification, this was a common method collectors and dealers used to authenticate a unique item. Breen-Gillio	 Numbering system base on the book California Pioneer Fraction Gold by Walter Breen and Ron Gillio. Brilliant	 Untoned. With no tarnish or oxidation, and with original cartwheel (frosty) or prooflike lustre. Copper coins are considered brilliant if they have full original red. Brilliant Proof	 A particular type of proof coin that has a full mirror surface in the fields. Brilliant Uncirculated	 A generic term for any coin that has not been in circulation. Bronze	 An alloy of copper and tin; special types also contain other elements. Brown	 The term applied to a copper coin that no longer has the red color of copper. It is abbreviated as BN when used as part of a grade or description. BU	 Acronym for Brilliant Uncirculated. BU rolls	 Wrapped coins (usually in paper) in specific quantities for each denomination. Cents are quantity 50, nickels quantity 40, dimes quantity 50, quarters quantity 40, half-dollars and dollars 20, etc. Buckled die	 A warped or distorted die. Can be caused by excess clashing. Often produces coins which are slightly bent. Buffalo nickel	 Slang for the Indian Head nickel, struck from 1913 to 1938. The animal depicted is an American Bison. Bulged die	 A die with a small indentation, formed from clashing. Results in “bulged” coins. Bullet toning	 See target toning. Bullion	 Ingots, coins, or other issues that trade for their intrinsic metal value. Only precious metals (silver, gold, platinum, and palladium) are included as bullion. Copper could also technically be considered as bullion. Bullion coin	 A legal tender coin that trades at a slight premium to its value as plain metal. Burn mark	 See counting machine mark. Burnishing	 A process in which the surfaces of a coin or a planchet are shined through rubbing or polishing. This term has both a positive and a negative context: In a positive sense, Proof planchets are burnished before they are struck. The procedure was done originally by rubbing wet sand across the surfaces to impart a mirror-like finish. In a negative sense, the surfaces on repaired or altered coins may be burnished by mechanical or chemical methods. For example, a high-speed drill with a wire brush attachment is used to achieve this effect. Burnishing lines	 Lines resulting from burnishing. Typically seen on open-collar Proofs and almost never observed on close-collar Proofs. Business strike	 A coin which was struck for use in general circulation, as opposed to a proof coin produced strictly for collector purposes. Bust	 The head and shoulders of the emblematic Liberty seen on many US issues. Bust dollar	 Slang term for silver dollars struck from 1795 through 1803. Buyer’s Premium	 A “Buyer’s Premium” is charged in addition to the successful bid according to the rate defined in our terms and conditions. C	 Mintmark indicating coins struck at the Charlotte, North Carolina branch Mint. Cabinet friction	 Slight friction seen on coins (usually the obverse) that were stored in wooden cabinets used by early collectors. To compound the problem, a soft cloth was often used to wipe dust away, causing light hairlines. Cameo	 A proof, or prooflike coin with exceptional contrast between the fields and the devices. On a cameo coin, the fields are mirrorlike, while the devices give a frosty appearance. Canadian silver	 Slang term for the silver coins of Canada. Capped Bust	 A term describing any of the various representations of the head of Miss Liberty depicted on certain early 1807-1839 U.S. coins by a bust with a floppy cap. The design is attributed to John Reich. Capped die	 An error in which a coin gets jammed in the coining press and remains for successive strikes. Eventually a “cap” is formed on either the upper or lower die. These are sometimes spectacular, with the cap often many times taller than a normal coin. Carbon spot	 A dark discoloration on the surface of a coin. It is possible that this discoloration is caused by a planchet imperfection prior to striking, or it may be caused by improper storage of the coin. Regardless of the cause, carbon spots are often difficult, if not impossible, to remove without leaving pits in the coin’s surface. If they are large enough, they may significantly lower the grade and value of a coin. Carson City	 The United States branch Mint located in Carson City, Nevada that struck coins from 1870 through 1885 and later from 1889 through 1893. Cartwheel	 An effect caused by the natural lustre on most mint state, and on some proof coins. When the coin is tilted back and forth, beams of light seem to circle the central devices of the coin. Also a slang term for Silver Dollar. Cast blanks	 Planchets that are molded, rather than cut from strips of metal. Cast counterfeit	 A replica of a genuine coin created by making molds of the obverse and reverse, then casting base metal in the molds. A seam is usually visible on the edge unless it has been ground down. Castaing machine	 A machine invented by French engineer Jean Castaing that added the edge lettering and devices to early U.S. coins before they were struck. Castaing machines were used until the introduction of close collar dies, which applied the edge device during the striking process. CC	 Mintmark used to indicate coins struck at the Carson City, Nevada branch Mint. Census	 A compilation of the known specimens of a particular numismatic item. Cent	 A denomination valued at one-hundredth of a dollar, struck by the U.S. Mint. CCE	 Certified Coin Exchange, the bid/ask real-time coin trading and quotation system owned by the American Teleprocessing Company. Chain Cent	 The popular name for the Flowing Hair Chain cent of 1793, the first coins struck in the newly occupied Mint building. Chapman Proof	 1921 Morgan dollar Proofs supposedly struck for coin dealer Henry Chapman, having cameo devices and deeply mirrored surfaces like most Morgan dollar Proofs. Charlotte The United States branch Mint located in Charlotte, North Carolina that only struck gold coins from 1838 until its seizure by the Confederacy in 1861. It never reopened as a mint after the Civil War, although it did serve as an official assay office from 1867 until 1913. Chasing	 A method used by forgers to create a mintmark on a coin. Chasing involves heating the surfaces and moving the metal to form a mintmark. Choice	 An adjective which the A.N.A. applies to coins of MS-65 or Proof-65 grade. Many dealers apply the term to the MS/Proof-63 coins, and call MS/Proof-65 coins “Gem”. Choice Unc	 Abbreviation for Choice Uncirculated. Choice Uncirculated	 An Uncirculated coin in grade MS-63 or MS-64. Circulated	 A term applied to a coin that has wear, ranging from slight rubbing to heavy wear. Circulation	 A term applied to coins that have been spent in commerce. Circulation strike	 A coin meant for commerce. An alternate term for Business Strike or Regular Strike. Clad	 A term used to describe any of the modern “sandwich” coins that have layers of both copper and nickel. Clad bag	 Usually applied to a $1,000 bag of 40% silver half-dollars although it also could apply to any bag of “sandwich” coins. Clash marks	 The images of the dies seen on coins struck from clashed dies. Clashed dies	 Extraneous design detail often appears on a die as a result of two dies coming together without a planchet between them during the minting process. Coins struck from such dies are said to be struck from clashed dies, or to have die clashes or clash marks. Classic Head	 An image of Miss Liberty that depicts the style of a Roman or Greek athlete wearing a ribbon around the hair. Cleaned	 When a coin has been cleaned with baking soda or other mild abrasives, it may have a slightly washed out appearance. If the lustre or color of a coin appears even the slightest bit unnatural as a result of past cleaning, the coin is usually described as “cleaned” when catalogued for sale. Clip	 Slang term for a coin struck from a clipped planchet. Clipped	 Term for an irregularly cut planchet. A clip can be straight or curved, depending upon where it was cut. Clogged die	 A die that has a contaminant lodged in the recessed areas. Coins struck from a clogged die will have diminished or even missing detail. Close collar	 An edge device sometimes called a collar die that surrounds the lower die. The close collar imparts reeding (see Reeded edge) or a smooth, plain edge. Coin	 Metal formed into a disk of standardized weight and stamped with a standard design to enable it to circulate as money authorized by a government body. Coin collection	 A grouping of coins assembled for fun or profit. Coin collector	 An individual who accumulates coins in a methodical manner. Coin friction	 Term applied to the area resulting when coins rub together in rolls or bags and small amounts of metal are displaced. Coin show	 An exchange composed of coin dealers displaying their items for sale and trade. Coinage	 The issuance of metallic money of a particular country. Commemorative	 Coins issued to honor some person (D. Boone), place (Mount Rushmore), or event (Special Olympics) and, in many instances, to raise funds for activities related to the theme. Sometimes called NCLT (non-circulating legal tender) commemoratives. Commercial grade	 A synonym for Market Grade. Commercial strike	 A synonym for regular strike or business strike. Common	 A numismatic issue that is readily available. Since this is a relative term, no firm number can be used as an exact cut-off point between common and scarce. Common date	 A particular issue within a series that is readily available. No exact number can be used to determine which coins are common dates as this is relative to the mintage of the series. Complete set	 A term for all possible coins within a series, all types (see Type), or all coins from a particular branch Mint. For example, a complete gold type set would include examples of all types from 1795 until 1933. Condition	 The state of preservation of a particular numismatic item. Condition Census	 A listing of the finest known examples of a particular issue. There is no fixed number of coins in a Condition Census. Condition rarity	 A term to indicate a common coin that is rare when found in high grades. Consensus grading	 The process of evaluating the condition of a coin by using multiple graders. Conserved	 Numismatic conservation involves examination, scientific analysis, and a reliance upon an extensive base of numismatic knowledge to determine the nature of a coin’s state of preservation and the extent of any damage. Conservation also encompasses appropriate procedures to protect the coin’s original appearance and to guard against future deterioration to whatever extent possible. Professional conservation should not be confused with “Coin Doctoring”, in which an attempt is made to improve the appearance and grade of a coin through deceptive means such as artificial toning and where unaccepted or unorthodox methods are employed. Also not qualifying as conservation is restoration where mechanical repairs are made such as filling holes, smoothing out scratches, and re-engraving of detail. Contact marks	 Marks on a coin that are caused by contact with another coin or a foreign object. These are generally small, compared to other types of marks such as gouges. Contemporary counterfeit	 A coin, usually base metal, struck from crude dies and made to pass for legal tender at the time of creation. Sometimes such counterfeits are collected along with the genuine coins, particularly in the case of American Colonial issues. Continental dollars	 “Dollars” struck in pewter (scarce), brass (rare), copper (extremely rare) and silver (extremely rare) that are dated 1776, but likely struck sometime later. Certain Benjamin Franklin sketches inspired the design. Copper spot	 A spot or stain seen on gold coinage, indicating an area of copper concentration that has oxidized. Copper spots or stains can range from tiny dots to large blotches. Copper-nickel	 The alloy (copper 88%, nickel 12%) used for small cents from 1856 through mid-1864. Copper-Nickel Cent	 Cents issued from 1856 through 1864 in the copper-nickel alloy. These were called white cents during the period because of their pale color compared to the earlier red cents. Coppers	 Slang for pre-Federal copper, half cents, and large cents, minted through 1857. Copy	 Any reproduction, fraudulent or otherwise, of a coin. Copy dies	 Dies made at a later date, usually showing slight differences from the originals. Also used to denote counterfeit dies copied directly from a genuine coin. Coronet Head	 Alternate name for Braided Hair design by Christian Gobrecht. This is sometimes also called the Liberty Head design. Corrosion	 Damage which occurs on the surface of some coins, generally due to improper storage. Corrosion is caused when a chemical reaction, such as rust, actually eats into the metal. Cost	 The price paid for a numismatic item. Counterfeit	 Literally, a coin that is not genuine. The term is applied to cast and struck counterfeits as well as issues with altered dates or added mintmarks. Counting machine mark	 A dense patch of lines caused by the rubber wheel of a counting machine. Caused when the wheel spacing was insufficient for the selected coin. Cud	 An area of a coin struck by a die that has a complete break across part of its surface. A cud may be either retained, where the faulty piece of the die is still in place, or full, where the piece of the die has fallen away. Cupro-nickel	 Any alloy of copper and nickel. D	 Mintmark used to identify coins struck at the Dahlonega, Georgia branch Mint from 1838 through 1861 or the Denver, Colorado Mint from 1906 forward. Dahlonega	 The branch Mint located in Dahlonega, Georgia that struck gold coins from 1838 until 1861 when it was seized by the Confederacy. Date	 The numerals on a coin representing the year in which it was struck. Restrikes (see Restrike) are made in years subsequent to the one that appears on them. DCAM	 Abbreviation for Deep Cameo. Dealer	 Someone who’s occupation is buying, selling, and trading numismatic material. Deep Cameo	 Term applied to coins, usually Proofs and prooflike coins that have deeply frosted devices and lettering that contrast with the mirror fields. Deep mirror prooflike	 Any coin that has deeply reflective mirror-like fields. While a general term, it is especially applicable for Morgan dollars. Denomination	 The value assigned by a government to a specific coin. Denticles	 The tooth-like projections which make up the inner rim on some coins. They were discontinued on most U.S. coins in the early twentieth century. Dentils	 Alternative term for denticles. Design	 The motif of a coin or other numismatic item. Barber coins and Washington quarters are examples of designs. Design type	 A specific motif placed upon coinage, which may be used for several denominations and subtypes. Designer	 The individual responsible for creating a particular motif used on a numismatic series. Device	 Any specific design element. Often refers to the principal design element. Device punch	 A steel rod with a raised device on the end used to punch the element into a working die. This technique was used before hubbed dies were used as a standard. Die	 A steel rod that is engraved, punched, or hubbed with the date, lettering, devices, and other emblems used to strike a coin. Die alignment	 Term to indicate the relative position of the obverse and reverse dies. Die break	 An area of a coin that is the result of a broken die. Die cracks	 Raised lines, which appear on a coin as a result of that coin having been struck by a cracked die. Die line	 Raised lines, which appear on a coin as a result of polish lines on the die. Die rust	 Pitting or roughness appearing on a coin as a result of that coin having been struck by a rusted die. Die state	 A readily identified point in the life of a coinage die. Dies go through a lifecycle – clashing, being polished, cracking, breaking, etc. These are called die states. Some die varieties have gone through barely distinguishable die states, while others display multiple distinctive ones. Die striations	 Raised lines on coins that were struck with polished dies. Die trial	 The test striking of a particular die in a different metal. Die variety	 A coin which has already been attributed by date, denomination, mintmark, and major variety (such as Morgan Dollar, 1879-S, Reverse of ’78) can often still be identified by die variety. Research has been done in many series assigning numbers to the various combinations of dies known to have struck coins of each of the various years and mintmarks. Die wear	 The loss of detail on a coin due to wear on the die used to strike it (rather than wear on the coin itself). Dime	 The denomination, one tenth of a dollar, issued since 1796 by the United States. Ding Slang for a small- to medium-sized mark on a coin. Dipped	 A coin which has been cleaned in a soap solution, the most popular of which is called Jewel Luster, is said to have been dipped. The term “dipped” is not necessary in, say, a catalog description of a coin, unless the dipping has caused noticeable dulling of lustre, or an otherwise unnatural appearance (typically on copper coins). The practice of dipping coins is not advisable, except by bonafide experts, and then only on rare occasions. Dipping solution	 Any of the commercial cleaners or “dips”on the market, usually acid-based. Disme	 The original spelling of dime. It is thought to have been have been pronounced to rhyme with ream (the s being silent). This spelling was used in Mint documents until the 1830s and was officially changed by the Coinage Act of 1837. Doctored	 Typically considered a derogatory term. A doctored coin has been enhanced by chemical or other means. Dollar	 A denomination consisting of one hundred cents authorized by the Mint Act of 1792. This is the anglicized spelling of the European Thaler and was used because of the worldwide acceptance of the Thaler and the Spanish Milled dollar (or piece-of-eight). Double Eagle	 Literally two eagles, or twenty dollars. A twenty-dollar U.S. gold coin issued from 1850 through 1932. Double(d) die	 A die that has been struck more than one time by a hub in misaligned positions, resulting in doubling of design elements. If shifting occurs in the alignment between a hub and a die, the die will have some of its features doubled. This doubling is then imparted to every coin it strikes. The coins struck from such dies are called doubled-die errors. The 1955 Doubled Die Lincoln cent is one such error. Double-struck	 A condition that results when a coin is not ejected from a die and is struck a second time (hence double-struck). Triple-struck coins and other multiple strikings also are known. Proofs are usually intentionally double-struck in order to sharpen their details; this is sometimes visible under magnification. Draped Bust	 The design of Miss Liberty with a drape across her bust. This is attributed to Mint engraver Robert Scot, who presumably copied the design after a portrait by Gilbert Stuart. Drift mark	 An area on a coin, often rather long, that appears streaky or discolored. This is the result of impurities or foreign matter in the dies. Dull	 Term for a numismatic item that lacks luster. Dulling may be the result of natural or artificial conditions. Eagle	 A gold coin with a face value of ten dollars. Along with the dollar, the eagle was the basis of the U.S. currency system from 1792 through 1971. Early American Coppers (Club)	 A club dedicated to advancing the study of pre-1857 United States copper coinage including Colonials. ED	 Acronym for environmental damage. Edge	 The third side of a coin. It may be reeded, ornamented, or plain. Edge device	 Letters or emblems on the edge of a coin. Examples would be the stars and lettering on the edge of Saint-Gaudens double eagles. Electrotype	 A duplicate coin created by the electrolytic method, where metal is deposited into a mold made from the original. The obverse and reverse metal shells are then filled with metal and fused together. The edges are then sometimes filed smooth to obscure the seam. Elements	 The various devices and emblems seen on coins. Eliasberg	 Short for Louis E. Eliasberg, Sr., who was the only collector ever to assemble a complete collection of United States coins. Emission sequence	 The order in which die states are struck. Also, the die use sequence for a particular issue. Engraver	 The person responsible for the design and/or punches used to craft a coin. Envelope toning	 Coloration that results from storage in small manila “coin envelopes”. Most paper envelopes contain reactive chemicals. Environmental damage	 Corrosion-effect seen on a coin that has been exposed to the elements. The damage may range from minor dulling to severe pitting. Eroded die	 Synonym for a worn die. Error	 A numismatic item that unintentionally varies from the norm. Overdates and overmintmarks are not considered errors since they were done intentionally. Other die-cutting “mistakes” are considered errors. Double dies, planchet clips, and off-metal strikings are also considered errors. Essai	 Term for trial or pattern strikings. The anglicized version is essay and literally means a test or trial. Extra Fine	 Alternate term for Extremely Fine. Extremely Fine	 Term for the grades EF40 and EF45. Extremely High Relief	 The 1907 double eagle issue designed by Augustus Saint-Gaudens. The coin had so much depth that multiple punches from a powerful press were required to fully bring up the detail. Because of this difficulty, the design was lowered, resulting in the High Relief. This too was lowered to create the Standing Liberty double eagle, or Saint. Eye appeal	 The aesthetic effect a coin has on its viewer. Although quite subjective, like any form of art, that which constitutes eye appeal is generally agreed upon by most experienced numismatists. Fake	 A counterfeit or altered coin. Fantasy piece	 A term applied to coins struck at the whim of Mint officials. Examples include the various 1865 Motto and 1866 No Motto coins. Fasces	 Term referring to the motif on the reverse of Mercury dimes. The design consists of a bundle of rods banded (wrapped) around an ax with a protruding blade. The designation “full bands” refers to fasces on which there is complete separation in the central bands across the rods. Fat head	 Term for the Small Size Capped Bust quarters and half eagles. FB	 Acronym for Full Bands. FBL	 Acronym for Full Bell Lines. FH	 Acronym for Full Head. Fiat currency	 Coins or paper money that do not have metal value or are not backed by metal value. Field	 The flat (or slightly curved) portion of a coin where there is no design. Fine	 Term for the grades F-12 and F-15. Finest known	 The best-known condition example of a particular numismatic item. First shot	 Term for the opportunity to buy a numismatic item before it is offered to others. First strike	 A coin struck early in the life of a die. First strikes can be characterized by striated or mirror-like fields if the die was polished. First strikes are almost always fully or well struck, with crisp detail. Five Indian	 Term for the Indian Head half eagles struck from 1908 to 1929. Five Lib	 Term for the Liberty Head half eagles struck from 1839 until 1908. Flat edge	 Term referring to the particular specimens of High Reliefs that do not have a wire edge. Flat luster	 A subdued type of gray or dull luster often seen on coins struck from worn dies. Flip	 1. A clear, flexible plastic holder used to display and store coins. Also see: PVC. 2. To quickly sell a recently purchased item – usually for a fast profit. Flip rub	 Discoloration, often only slight, on the highest points of a coin caused by contact with a flip. Flow lines	 Lines, sometimes visible, resulting from the metal flowing outward from the center of a planchet as it is struck. Cartwheel lustre is the result of light reflecting from flow lines. Flowing Hair	 The design of Miss Liberty with long, flowing hair that is attributed to Mint engraver Robert Scot. Flying Eagle	 Term for Flying Eagle Cent. Flying Eagle Cent	 The small cent, struck in 88% copper and 12% nickel, that replaced the large cent. Focal area	 The area of a coin to which a viewer’s eye is drawn. Liberty’s cheek is the focal point of the Morgan Dollar. Foreign	 A numismatic item not from the United States. Four-dollar gold piece	 An experimental issue, also known as a stella, struck in 1879-1880 as a pattern coin. Franklin half-dollar	 The half-dollar struck from 1948 until 1963 designed by John Sinnock. The coin featured Ben Franklin on the obverse and the Liberty Bell on the reverse. Friction	 A disturbance which appears either on the high-points of a coin or in the fields, as a result of that coin rubbing against other objects. A coin is said to have friction when only the lustre is disturbed, and no actual wear of the metal is visible to the naked eye. Frost	 An effect seen on the raised parts of a coin whereby the metal appears crystallized. Frosted devices	 Raised elements on coins struck with treated dies to impart a crystallized appearance. FS	 Acronym for Full Steps. Fugio cents	 1787 one-cent coins that are considered by some to be the first regular issue U. S. coin. Since they were authorized by the Continental Congress, this would seem to be a logical assumption. However, Congress did not pass the Mint Act until 1792, so an argument for the half dismes (half-dimes) of 1792 as the first regular issue is also valid. Full Bands	 Abbreviated as FB, this term is applied to Mercury (Winged Liberty Head) dimes when the central band is fully separated. Full Bell Lines	 Abbreviated as FBL, this term is applied to Franklin half-dollars when the lower sets of bell lines are complete. Full Head	 Abbreviated as FH, this term is applied to Standing Liberty quarters when the helmet of the head has full detail. Full Steps	 Term applied to a Jefferson five-cent piece when 5½ or 6 steps of Monticello are present. Full strike	 A numismatic item that has full detail. The metal flows into all areas of the die. FUN Show	 The annual convention sponsored by the Florida United Numismatists (FUN) held in early January. Considered by most dealers to be the best coin show of the year! Galvano	 The large metal relief turned in a portrait lathe to become a steel hub. Garrett	 Term relating to the Garrett family. There were two main collectors, Thomas H. Garrett and John W. Garrett, who formed this extensive collection from the late 1800s through the early 1900s. It was later given to Johns Hopkins University and sold in five auction sales. Gem	 An adjective that the A.N.A. applies to coins which grade Mint State or Proof-67. Most dealers, however, apply the adjective to any coin which they grade MS/Proof-65. Gem BU	 Synonym for Gem Brilliant Uncirculated. Gobrecht dollar	 Silver dollars dated 1836, 1838, and 1839 struck in those years and later restruck. Named for their designer, Christian Gobrecht, Chief Engraver from 1840-44. Gold commemorative	 Any of the eleven gold coins struck from 1903 until 1926 to honor a person, place, or event. Also, any of the modern United States commemorative gold issues sometimes referred to as modern gold commems. Gold dollar	 Small coins of one-dollar denomination struck from 1849 until 1889. Good	 The grades G-4 and G-6. Grade	 The numerical or adjectival condition of a coin. Grader	 A person who evaluates the condition of coins. Grading	 The process of numerically quantifying the condition of a coin. Hair	 The area of a coin that represents hair and may be an important aspect of the grade. Hairlines	 Thin, shallow scratches on the surface of a coin, usually caused by improper cleaning, or mishandling. Hairlines are found on virtually all proof coins, and are considered the most important single factor in grading high quality proof coins. They sometimes appear on business strikes as well. Hairlines tend to show up more often on proof-like business strikes. Half cent	 The lowest-value coin denomination ever issued by the U. S., representing 1/200th of a dollar. Half cents were struck from 1793 until 1857. Half disme	 The original spelling of half dime. The first United States regular issue was the 1792 half disme supposedly struck in John Harper’s basement using the newly acquired Mint presses. Half Dollar	 The denomination first struck in 1794 that is still issued today. Half Eagle	 Literally, half the value of an Eagle. The Eagle was defined by the Mint Act of 1792 as equal to ten silver dollars. Hammer die	 The upper die that is non-stationary. While usually the obverse, on some issues with striking problems, the reverse was employed as the hammer die. Haze	 A cloudy film seen on business-strike coins and Proofs. It may occur naturally or be added. Heraldic Eagle	 Also called the large eagle, this emblem of Liberty got its name because of its resemblance to the eagles of heraldry. High end	 A term applied to any coin at the upper end of a particular grade. High Relief	 A coin with deep concave fields, due to its design. High relief coins required extra pressure to be fully struck, and were difficult to stack. Therefore, the few coins struck in high relief by the U.S. Mint (such as the 1921 Peace dollar and the 1907 Roman Numerals double eagle) were each made for only one year. Hoard	 A group of coins held for either numismatic or monetary reasons. Hoard coin	 A coin that exists, or existed, in a quantity held by an individual, organization, etc. Examples include Stone Mountain half dollars still held by the Daughters of the Confederacy. Hoarder	 An individual who amasses a great quantity of a numismatic item. Holder toning	 Any toning acquired by a coin as a result of storage in a holder. Hub	 Minting term for the steel device that is used to produce a die. Impaired Proof	 A Proof coin that grades lower than PR-60. Incomplete strike	 A coin that is missing design detail because of a problem during the striking process. An incomplete strike may be due to insufficient striking pressure or improperly spaced dies. Incuse design	 The intaglio design used on Indian Head quarter eagles and half eagles. The devices on these coins were recessed to try and deter counterfeiting and improve durability. ICG	 Independent Coin Grading Company is a grading service located in Englewood, CO.
Indian cent	 Synonym for an Indian Head cent. Indian Head cent	 Cents struck from 1859 until 1909 designed by James Longacre. Indian Head eagle	 The Saint-Gaudens designed ten-dollar gold coin struck from 1907 until 1933. Indian penny	 Synonym for Indian Head cent. Intrinsic value	 The value of the metal(s) contained in a numismatic item. The United States issues contained their intrinsic value in metal until 1933 for gold coins and 1964 for silver coins. Modern U.S. coins are termed fiat currency (see Fiat currency). Iridescent	 Probably the most desirable form of toning on a silver or nickel coin. Iridescent toning covers virtually all of the coin’s surface, while still permitting all of the coin’s natural lustre to shine through with its full intensity. Jefferson nickel	 The five-cent coin struck beginning in 1938 through to this day. Felix Schlag was the designer. Knife edge	 Synonym for wire edge. Lamination	 A form of planchet flaw caused by imperfections in the metal, whereby a thin strip of the metal separates itself from the coin. Large cent	 A large copper U.S. coin - issued from 1793 until 1857 - valued at one-hundredth of a dollar. It was later replaced by a much smaller cent made from a copper-nickel alloy. Large date	 Term referring to the size of the digits of the date on a coin. The use of this term implies that a medium or small date exists for the coin or series. Large Eagle	 Synonym for Heraldic Eagle. Large letters	 Term referring to the size of the lettering of the date on a coin. The use of this term implies that medium or small letters exist for the coin or series. Large Motto	 Synonym for the 1864 two-cent coin with large lettering for the motto “IN GOD WE TRUST”. Congress mandated this inscription for all coinage and it has been used on nearly every coin since that time. Large size	 A term referring to the particular diameter of a coin in a series. The use of this term implies that there is a small size with the same motif. LD	 Acronym for large date. Legend	 Any phrase that appears on a coin. For example “UNITED STATES OF AMERICA”. Lettered edge	 A coin edge that displays an inscription or other design elements, rather than being plain or reeded (see Reeded Edge). Lettering	 The alphabet characters used in creating legends, mottos, and other inscriptions on a coin. Lib	 Term for Liberty Head. (i.e. a $10 Lib, a $20 Lib). Liberty	 A symbolic figure used in many U.S. coin designs. Liberty Cap	 The head of Miss Liberty, with a cap on a pole by her head. This design was used on certain U.S. half cents and large cents. Liberty Head	 The design used on most U.S. gold coins from 1838 until 1908. Morgan dollars and Barber coinage are also sometimes referred to as Liberty Head coins. Liberty Seated	 The motif featuring Miss Liberty seated on a rock first used on the Gobrecht dollars of 1836-1839. This design was used on nearly all regular issue silver coinage from 1837 through 1891. Lincoln	 Synonym for a Lincoln Head cent. Lincoln cent	 Cent designed by Victor D. Brenner that was first issued in 1909 and continues through today, although the reverse design was changed to the Memorial Reverse in 1959. Lincoln penny	 Synonym for Lincoln Head cent. Lint mark	 A characteristic that occurs mostly on proof coins as a result of a piece of lint on the die or planchet during the striking process. This lint creates an incused scratch-like mark on the coin. Lint marks are distinguishable from hairlines by their evenness of depth and lack of raised ridges on their borders. They are also identifiable by their interesting thread-like shapes. Since a lint mark is mint-caused, it has a much smaller effect on the grade and value of a coin than a hairline of equal size and prominence. LL	 Acronym for large letters. Long Beach	 Synonym for the Long Beach Coin and Stamp Exhibition held in Long Beach, California, America’s largest commercial coin show. This show is held three times a year, usually in February, June, and October. Lot	 A unique number assigned by an auction house to an item or items sold in a particular sale. Loupe	 A magnifying glass used to examine coins. Lustre	 The brightness of a coin that results from the way in which it reflects light. Many different types of lustre exist, and one of the trickiest parts of the grading process is determining whether the lustre of a coin is artificial (see whizzed), natural as made, or diminished through wear, friction, cleaning, or other factors. Lustrous	 A term used to describe a coin that still has its original mint bloom. Major variety	 A coin that is widely recognized as having a major difference from other coins of the same date, design, type, and mint. Market grade	 The grade at which most reputable dealers and auction houses would offer an uncertified coin. Marks	 Imperfections acquired after a coin is struck. Master hub	 The original hub created by the portrait lathe. Master dies are created from this hub. MD	 Acronym for medium date. Medal press	 A high-pressure coining press acquired by the U.S. Mint, in the 1850s. It was used to strike medals, and other issues. Medium date	 Term referring to the size of the digits of the date on a coin. The use of this term implies that a large or small date exists for the coin or series. Medium letters	 Term referring to the size of the lettering on a coin. The use of this term implies that large or small letters exist for that coin or series. Melt	 Term for the intrinsic metal value of a coin. Mercury dime	 Common name for the Winged Liberty Head dime issued from 1916 through 1945. (Also “Merc”). Metal stress lines	 Radial lines, sometimes visible, caused by metal flowing outward from the center of the planchet during the minting process. Milling mark	 A series of two or more small nicks on a coin which result from contact with the reeded edge of another coin, usually in a mint bag. Milling marks are generally more detrimental to the grade than normal bagmarks, because of their severity of depth and greater visual impact. Also see: Reeding Mark. Minor variety	 A coin that has a minor difference from other coins of the same design, type, date, and mint. Mint	 A facility where coins are crafted. Mint bloom	 Original lustre that is still visible on a coin. Mint set	 A group of Uncirculated coins from a particular year, usually comprising coins from each Mint. Mint set toning	 Term referring to toning acquired by coins after years of storage in their original cardboard holders. Mint State	 Describes a coin that has never been in circulation. Thus, the coin has no wear. A mint state coin may still be weakly struck, and therefore lack the detail of even a lower grade coin. All mint state coins have some imperfections if you study them hard enough. The term “Mint State” may also correctly be applied to coins that were struck as proofs. Mintage	 The number of coins of a particular date struck at a given mint during a specific year. Mintmark	 Letter(s) stamped into a coin to denote the mint at which it was struck. Mis-struck	 Term applied to “error coins” with striking irregularities. Mishandled Proof	 A proof coin that somehow escaped into circulation or was otherwise significantly abused. ML	 Acronym for medium letters. Morgan	 Synonym for Morgan dollar. Morgan dollar	 Term for the Liberty Head silver dollar struck from 1878 through 1904 and once again in 1921. George Morgan was only an assistant engraver, but his design for the dollar was selected over William Barber’s. Mottled toning	 Splotchy, uneven toning. Motto	 An inscription on a coin. The most popular being IN GOD WE TRUST, which first appeared on the 1864 two-cent piece and is now is required on all U.S. coinage. MS	 Acronym for Mint State. Mutilated	 A coin that has been damaged to the point where it no longer can be graded. New	 Term for a coin that never has been in circulation. New Orleans	 The branch Mint established in 1838 in New Orleans, Louisiana. It struck coins for the United States until its seizure in 1861 by the Confederacy. (Some 1861-O half-dollars were struck after the seizure.) It reopened in 1879 and struck coins until 1909 (actually closed in 1910). Now this facility is a museum. NGC	 Acronym for Numismatic Guaranty Corporation, located in Parsippany, NJ. Currently the leading coin grading service. NGC Census Report	 Quarterly publication issued by NGC listing the number of coins graded and their grade. Nickel	 Popular term for a five-cent piece. No Motto	 Coins struck without the motto, “IN GOD WE TRUST”. No Stars	 Term referring to the Gobrecht-designed Liberty Seated coins without stars. No “CENTS” nickel	 Liberty Head nickels struck in 1883 without a denomination. The lack of a denomination was very confusing to the public and led to the “racketeer” nickel scandal. No-grade	 Term applied to a coin returned from a third-party grading service that was not encapsulated. This can be due to questionable authenticity, cleaning, damage, or other reasons. Numerical grading	 The Sheldon 1-70 scale employed by NGC, PCGS, and other third-party grading services. Numismatics	 The science of money. Coins, currency, tokens, inscribed bars, and all related items are numismatic. Numismatist	 One who studies or collects money. O	 Mintmark used to signify coins struck at the New Orleans, Louisiana branch Mint. O-Mint	 Term used for the coinage of the branch Mint in New Orleans, Louisiana. Obverse	 The front (heads side) of a coin. Oct	 Synonym for octagonal – the Pan-Pac octagonal commemorative fifty-dollar coin. Off center	 A coin struck on a blank that was not properly centered over the anvil, or lower, die. Open collar	 A device used to position a planchet over the lower die. It was employed specifically for striking early U.S. coins whose edges had already been stamped with reeding or lettering. Orange-peel surfaces	 Dimpled fields seen on many Proof gold coins, and some Mint State gold dollars and $3 gold coins. Original	 Referring to any aspect of a coin that retains its original state. Original toning means natural, not retoned or cleaned. Original lustre means undisturbed lustre that hasn’t been enhanced through artificial methods. Original roll	 A roll of coins, all the same date, denomination, and mintmark, and usually of the same die variety, which seem to have been acquired by the same original owner, probably from the same original mint bag. Generally, all the coins in an original roll will have similar toning and lustre. Original toning	 Referring to a coin that has never been cleaned or dipped. Original toning ranges from a very mild yellow to extremely dark blues, grays, browns, and finally black. Over -mintmark	 A coin struck with a die on which one mintmark is engraved over a different mintmark. In rare instances, branch mints returned dies that already had mintmarks punched into them; on occasion, these were later sent to different branch mints and the new mint altered the die to add its mintmark over the old one. Examples include the 1944 D/S Lincoln Cent, and the 1949 D/S Jefferson Nickel. Over dipped	 A coin whose lustre has been dulled from too many baths in a dipping solution. Overdate	 A coin struck from a die with a date that has one year punched over a different year. P-Mint	 Synonym for the U.S. Mint located in Philadelphia, Pennsylvania. Pan-Pac	 Synonym for Panama-Pacific Exhibition. Pan-Pac slug	 Synonym for the round or octagonal 1915-dated Panama-Pacific fifty-dollar commemorative coins. Panama-Pacific Exhibition	 A 1915 exhibition held in San Francisco, California to celebrate the completion of the Panama Canal. Paper money	 Synonym for currency. Pattern	 A test striking of a coin produced to trial a proposed design, composition, or size. Patterns were often struck in metals other than the one proposed. PCGS Population Report	 Monthly publication by PCGS listing the number of coins graded and their grade. Peace dollar	 Synonym for the silver dollar struck from 1921 to 1935. The Peace dollar was designed by Anthony Francisci to commemorate the peace following World War I. 1921 featured another coin designated High Relief. In 1922, the relief was lowered resulting in the Regular Relief type that was issued through 1935. Pedigree	 The listing of a coin’s current owner plus all known previous owners. Penny	 Synonym for a one-cent U.S. coin. Peripheral toning	 Coloring – which may be light, medium, or dark - around the edge of a coin. Philadelphia	 The primary U.S. Mint located in Philadelphia, Pennsylvania. It was first established in 1792. Pioneer gold	 Privately issued gold coins struck prior to 1861. The term is generally associated with the private issues from California and the other post-1848 ore finds in Nevada, Oregon, and Colorado. Plain edge	 A smooth, flat edge seen mainly on a small-denomination coinage. Planchet	 The blank metal disk, which becomes a coin when struck under high pressure between two dies. Planchet flaw	 An irregular hole in a coin blank, sometimes the result of a lamination that has broken away. Plated	 A coin with a thin layer of metal applied. For example, gold-plated copper strikings of certain U.S. pattern coins. Platinum	 A precious metal sometimes used for coinage. The only United States issues struck in platinum are the pattern half dollars of 1814 and modern platinum Eagles. Plugged	 Term used to describe a coin that has had a hole filled, often so expertly that it can be discerned only under magnification. PNG certificate	 A document (in duplicate: one for the coin owner and one kept on-file at PNG) completed by a PNG dealer that provided a guarantee of authenticity prior to third-party grading services. PO	 Abbreviation for Poor. (Also P). Polished die	 A die that has been basined to remove clash marks or other die injury. Dies used to strike Proof coins were polished to impart mirrorlike surfaces. Polyvinyl chloride	 A somewhat active chemical found in some types of plastic coin flips. Polyvinyl Chloride will cause some coins to tone or turn green over time. Poor	 Synonym for the grade PO-1 (or P1). Pop Report	 Synonym for a report issued by NGC or PCGS, which summarizes the coins certified to date. PQ	 Acronym for premium quality. Premium quality	 A term which describes the very finest coins that fall into any given grade, or that have some claims to a higher grade. Presentation striking	 A coin, often a Proof or an exceptionally sharp business strike, specially struck and given to a dignitary or other person. 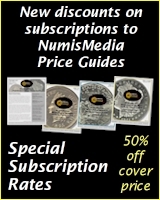 Price guide	 A periodical listing prices for numismatic items. The guide might differentiate between buy and sell (Bid/Ask), as well as wholesale or retail prices. Pristine	 Term describing coins in original, unimpaired condition. Pristine coins are typically graded MS/PR-67 and higher. PCGS	 Professional Coin Grading Service, a leading third-party coin grading service located in Newport Beach, California. PNG	 Professional Numismatists Guild, an organization of Numismatic dealers founded in 1955. Proof	 The term Proof denotes a method of manufacture, not a grade. Proof coins are made with special care, exclusively for collectors or investors and not struck for general circulation. Generally, proof coins are struck on specially selected and polished planchets. They are struck using polished dies. Usually the coins are made on a slower moving press, and/or are struck more than once. Most proof coins are brilliant, with a mirrorlike surface. Proof set	 A coin set containing Proof issues from a particular year. A few sets contain anomalies such as the 1804 dollar and eagle in 1834 presentation Proof sets. Proof dies	 Dies which are prepared and used exclusively to produce proof coins. Often, the fields of proof dies are highly polished to impart a mirrorlike finish, and the recessed areas are left unfinished to create frosted devices. Proof-only issue	 A coin struck only as a Proof, with no business-strike counterpart. Prooflike	 A coin that has mirror-like surfaces. This term is particularly applicable to Morgan dollars. Punch	 A steel rod with a device, a date, lettering, and other symbols on the end which was hammered into a working die. PVC	 Acronym for polyvinyl chloride. PVC damage	 A film, often green, left on a coin after storage in flips that contain PVC. During the early stage, this film may be clear and sticky. PVC flip	 Synonym for a coin flip that contains PVC. Quarter	 A U.S. coin of the quarter dollar denomination. Quarter Eagle	 Literally, one-fourth of an eagle, equal to a two-and-one-half dollar gold coin. The quarter eagle was first struck in 1796, struck sporadically thereafter, and was discontinued in 1929. Questionable toning	 Suspicious color on a coin that may not be natural. Racketeer nickel	 A gold-plated 1883 No “CENTS” Liberty Head five-cent coin (“V” nickel). Legend has it that a deaf-mute gold-plated these unfamiliar coins and would use them as legal tender. Sometimes, he was given change for a five-dollar gold piece since the V on the reverse could be interpreted as either five cents or five dollars! They have also been gold-plated since that time to sell to collectors. Rainbow toning	 Toning which is usually seen on silver dollars stored in bags. A full spectrum of colors are represented, beginning with yellow, then green, to red, to blue, and sometimes even black. Rare	 1. A relative term indicating that a coin within a series is very difficult to find. 2. A coin with only a few examples known. 3. A term sometimes applied to all coins of numismatic value (as in: Rare Coin Dealer). Rarity	 The total number of extant specimens of a particular numismatic item. Condition rarity describes the number of specimens in a particular grade plus any in higher grades. Rarity scale	 A numerical-rating system used to quantify rarity. One example is the Universal Rarity Scale. Raw	 Refers to any coin that is not encapsulated by a grading service. Rays	 Term for the lines that represent sun rays on a coin’s design. RB	 Abbreviation for red and brown or Red-Brown. Red-Brown	 Describes a copper coin that has from 5 to 95 percent of its original mint color remaining (Abbreviated as RB). Reeded edge	 Grooved notches found on the edge of some coins. Regular issue	 A coin struck for commerce. There may be Regular and/or Proof strikes, as well as die trials of regular issues. Also see: Business strike and Commercial strike. Regular strike	 Synonym for business strike. A coin struck using conventional coin pressing methods. Relief	 The height of the devices of a particular coin design. Replica	 A copy, or reproduction. Restrike	 A coin struck later than indicated by its date, often with different dies. Retoned	 A coin that has been dipped or cleaned and then has regained color – either naturally or artificially. Reverse	 The back or “tails” side, of a coin. Rim	 The raised area around the edges of the obverse and reverse of a coin. Rim ding	 Synonym for a rim nick. Rim nick	 A mark or indentation on the rim of a coin. Ring test	 A test that may determine whether a coin was struck or is an electrotype or cast copy. The coin is balanced on a finger and gently tapped with a metal object. Genuine coins have a high-pitched ring or tone, while electrotypes and cast copies have little or none. It should be noted that this test is not always an accurate method for identifying electrotype or cast copy coins. Rip	 A slang term for a coin which was purchased below the market wholesale price and is easily resalable for a good profit. Roll	 A set number of coins stored in a coin wrapper. Rolls were originally paper wrappers, and today are typically plastic. Roll friction	 Minor displacement of metal, mostly on the high points, seen on coins stored in rolls. Rolled edge	 A synonym for rolled rim. Rolled Edge Ten	 Common name for a particular 1907 variety of the Indian Head eagle. Roller marks	 Parallel incuse lines found on a coin after it is struck. It is believed that roller marks are caused when the strips of metal are pulled through draw bars (set at a precise distance apart to ensure the planchet blanks will be at the correct thickness). Roman finish	 A scaly finish, similar to that of Satin Proofs. This was an experimental Proof surface used mostly on U.S. gold coins of 1909 and 1910. Round	 Synonym for a round Pan-Pac commemorative fifty-dollar coin. Rubbing	 The barest trace of wear on the high points of a coin. Just a step more severe than “friction” on the scale of adjectives used to describe degrees of wear. Usually, a coin with rubbing has virtually full mint lustre intact. S VDB	 Synonym for the 1909-S VDB Lincoln Head penny. S-Mint	 Term applied to coins struck at the San Francisco, California branch Mint. Saint	 Synonym for the Saint-Gaudens inspired double eagle gold coin. Saint-Gaudens	 Family name of Augustus Saint-Gaudens, the preeminent sculptor of the late nineteenth and early twentieth century. At the request of President Teddy Roosevelt, he began a redesign of the eagle and double eagle coins in 1907 although he died mid-production. San Francisco	 The United States branch Mint located in San Francisco, California that struck coins from 1854 through 1955, and again from 1965 to today. Satin lustre	 Fine, silky finish seen mostly on copper and nickel business strike coins. Almost no “cartwheel” effect is seen on coins with satin lustre. Scratch	 A mark on a coin that is more severe than a hairline. Screw press	 The first type of coining press used at the U.S. Mint. The screw press had a fixed lower die, and an upper die attached to a threaded rod. By rotating a series of weighted arms that were attached to the threaded rod, the screw mechanism drove the upper die downward to strike the planchet. The screw press invention is credited to Donato Bramante. SD	 Acronym for small date. Sea salvage coin	 A coin retrieved from the ocean, often recovered from a ship wreck. Seated	 Synonym for Liberty Seated silver coins issued from 1837 through 1891. Seated coinage	 Synonym for Liberty Seated coinage. Second toning	 Natural or artificial toning that occurs after a coin is dipped or cleaned. Semi-common	 A coin that is considered neither common, nor scarce. Semi-numismatic	 Refers to a coin that has a significant bullion value and some numismatic value. Semi-prooflike	 A coin that has almost enough mirror-like reflectiveness to be called “prooflike”. Series	 A particular design or motif used over a period of time. This can refer to a single denomination, or in some cases, several denominations. Set	 A collection of coins in a series. This could be a collection of types, or a collection from a particular Mint. Sheldon	 The late Dr. William H. Sheldon who wrote the seminal work on 1793 to 1814 large cents. Sheldon Book	 The large cent book, first published in 1949 as Early American Cents and reissued in 1958 as Penny Whimsy by W. Sheldon, W. Breen and D. Paschal. Sheldon numbers	 The reference numbers (S-1, S-2, etc.) for 1793 to 1814 large cents as documented in the books, Early American Cents and Penny Whimsy. Mint State – 60, 61, 62, 63, 64, 65, 66, 67, 68, 69, 70. Shield	 A design used on certain issues that has horizontal and vertical lines in a shield shape. Shield nickel	 Synonym for the Shield five-cent coin struck from 1866 until 1883. Shiny spots	 Areas on Matte, Roman, and Satin Proof coins where the original dulled surface has been disturbed. Show	 Synonym for a bourse or coin show. Sight seen	 A term meaning that the buyer of a particular numismatic item in a particular grade may view the coin before buying it. Sight unseen	 A term meaning that the buyer of a particular numismatic item in a particular grade offers to pay a certain price without examining the item. 2 – Referring to coins struck in silver (generally 90% silver and 10% copper but there are a few exceptions). Silver commem	 Synonym for silver commemorative coins. Silver commemoratives	 Coins struck at various times from 1892 through 1954 and post-1982, to celebrate a person, place, or event. Silver nickel	 Synonym for Wartime nickel. Silver-clad	 A coin whose overall metal makeup is 40% silver and 60% copper. Kennedy half dollars (struck from 1965 until 1970) are silver-clad halves. Skirt lines	 Lines representing the folds of Liberty’s flowing gown on Walking Liberty half-dollars. SL	 Acronym for small letters. Slab	 The plastic holder in which a grading service will encapsulate a coin which has been graded. Slabbing	 The process of encapsulating a coin in a sonically sealed holder. Sleeper	 A coin which is undervalued or underpriced. Slider	 A coin which a less scrupulous individual might sell at a higher grade than it really merits. The term usually refers to a nearly mint-state coin which is, or could be offered as a full mint-state. Slug	 Term for the octagonal and round fifty-dollar gold coins struck during the California gold rush. Legend has it that the term came about when criminals used the two-and-one-half ounce coins wrapped in a cloth to bonk their victims on the head. For an unrelated reason, 1915 Pan-Pac fifty-dollar commemorative issues are also referred to as slugs. Small cent	 Cents of reduced size that replaced the large cent as of 1857. Small date	 Term referring to the size of the digits of the date on a coin. The use of this term implies that a large or medium date exists for that coin or series. Small Eagle	 Referring to the coin design with the plain eagle on a perch, first used on the 1794 half dime and half dollar. Small letters	 Term referring to the size of the lettering used in the design on a coin. The use of this term implies that large or medium letters exist for the coin or series. Small Motto	 Abbreviation for the variety of two-cent coin of 1864 with small letters in the motto “IN GOD WE TRUST”. Small size	 A term referring to the diameter of a coin in a series. The use of this term implies that there is a large diameter coin with the same motif. SP	 Abbreviation for Specimen Strike. Spark-erosion die	 A die made by an electrolytic deposition method. Because the surfaces of the die are very rough (a result of the process), they must be polished to remove surface imperfections. Spark-erosion strike	 A coin made from spark-erosion dies, often showing signs of pitting in the relief areas as a result of the die surface. Special Mint Set	 A set of special coins that were first struck in limited quantities in 1965 and officially released in 1966-1967. They were intended to replace Proof sets, which had been discontinued by the U.S. Mint in an effort to stop coin hoarding. In 1968, The Mint resumed the issuing of Proofs. Specimen	 Referring to a special set of coins struck at the Mint from 1792 to 1816 that display many characteristics of the later Proof coinage. Split grade	 A coin whose obverse grade is different from its reverse grade. Examples: MS-63/65 or Proof 63/60. Splotchy toning	 Color that is uneven, in both shade and composition. Spot	 A discolored area on a coin. A spot or spots can have a small or large effect on the grade of a coin depending many factors such as size, severity, and placement. St. Gaudens	 Common misspelling of the last name of Augustus Saint-Gaudens. Also used as a synonym for the Standing Liberty double eagle (Saint). Standard silver	 The official composition of U.S. silver coinage, determined by the Mint Act of 1792. Initially set at approximately 89 percent silver and 11 percent copper, it was later changed to 90 percent silver and 10 percent copper. Standing Liberty	 Design motif of Miss Liberty in an upright front-facing position. Standing Liberty quarter	 Synonym for the quarter dollar struck from 1917 until 1930. It was designed by Hermon MacNeil. Staple scratch	 A line on a coin resulting from its improper removal from a cardboard stapled holder. Star	 A five-pointed or six-pointed design element used on many U.S. coins. State quarter	 Synonym for the 1999 and later Washington quarters struck with unique reverse designs for each State. These quarters are to be issued in the order of admittance to the United States. The order for the original 13 colonies was determined by the date which each State ratified the Constitution. Steam-powered press	 A coining press driven by a steam-powered engine. Steel cent	 1943 cents - and certain 1944 cents struck on leftover steel blanks - struck in steel and plated with zinc. Steelies	 Synonym for 1943 steel cents. Stella	 Abbreviation for the experimental four-dollar gold coins struck by the U.S. Mint in 1879-1880. The term comes from the large star on the coins’ reverse. Stock edge	 A counterfeit edge collar used for creating fake coins. Striations	 Term for the incuse polish lines on a die which result in raised lines on coins. While these are usually fine, parallel lines, they may also manifest themselves as swirling, or even criss-cross lines. Planchet striations are burnishing lines not struck away by the minting process that are incuse on the coins. Strike	 The sharpness of detail which the coin had when it was Mint State. A full strike is a coin that exhibits the full detail that would appear on the sharpest known examples of that type. Strip	 The flat metal, rolled and drawn to proper thickness, from which planchets are cut. Struck	 Term describing a coin produced from dies and a coining press. Struck copy	 A replica of a particular coin made from dies, possibly but not necessarily meant to deceive. Struck counterfeit	 A fake coin produced from false dies. Surface preservation	 The condition of a coin’s surface. Surfaces	 The entire obverse and reverse faces of a coin. Sweating	 A procedure in which coins are placed in a bag and shaken vigorously to knock off small pieces of metal. The bits of metal are gathered and sold as scrap, leaving the original coins to be returned to circulation at face value. A practice mainly employed with gold coins, leaving their surfaces peppered with tiny nicks. Tab toning	 Term referring to toning often seen on commemorative coins which were sold in cardboard holders with a round tab. Such coins have a circle in the center and are said to have “tab toning”. Tail feathers	 Refers to the tail feathers on the Eagle on the reverse of certain U.S. coins. Particularly, the Morgan Silver Dollar. Target toning	 Toning effect that resembles an archery target - with deeper colors on the periphery often fading to white or cream color at the center. Technical grading	 A system of grading which only takes into account that which has happened to a coin after the minting process (i.e. the state of preservation). Technical graders often ignore factors such as strike and eye-appeal. Ten	 Slang for an eagle or ten-dollar gold coin. Ten Indian	 Synonym for an Indian Head eagle. Ten Lib	 Synonym for a Liberty Head eagle. Territorial Gold	 Coins and bars privately struck during the various gold rushes. TF	 Abbreviation for Tail Feathers. Three	 Synonym for the Indian Head three-dollar gold coin. Three Cent Nickel	 Three-cent coins composed of 75% copper and 25% nickel struck from 1865 -1889. The Liberty Head design by James Longacre was copied from the earlier Liberty Head motif by Christian Gobrecht. Three Cent Silver	 Three-cent coin with a star motif that was struck in silver alloy. Thumbed	 Term for a coin that has been doctored in a specific way to hide marks, hairlines, or other disturbances. The thumb is rubbed lightly over the disturbances, and the oils in the skin help to disguise any problems. Tissue toning	 Color, often vibrant, acquired by coins stored in original Mint paper. The toning is caused by sulfur in the paper reacting with the coin. Token	 A substitute for a coin. Toned	 An adjective which describes a coin with toning. Tooling mark	 A line, usually small and fine, found on both genuine and counterfeit coins. They are caused by touch-ups to dies. Trade dollar	 A U.S. silver coin issued from 1873 until 1885 that is slightly heavier than the regular silver dollar. Named because it was intended to facilitate trade in the Far East, the Trade dollar was made with a marginally higher silver content in an attempt to gain acceptance in commerce throughout the world. Transfer die	 A die created by sacrificing a coin for a model. Transitional	 Synonym for transitional issue. Transitional issue	 A coin struck after an “official” series ends, or before an “official” series starts. It can also refer to a coin struck with either the obverse or the reverse of a discontinued or upcoming series. Treasure coin	 A coin known to have come from a shipwreck or from a buried or hidden source. Trime	 Synonym for a three-cent piece. Turban Head	 Synonym for Draped Bust. Twenty	 Synonym for a double eagle or twenty-dollar gold coin. Twenty Lib	 Synonym for a Liberty Head double eagle or twenty-dollar gold coin. Two and a Half	 Synonym for a quarter eagle or two-and-one-half dollar gold coin. Two-cent piece	 Synonym for the Shield two-cent coin struck from 1864 - 1873. Type	 A date or group of dates encompassing all of a particular standard design. Example: Morgan silver dollars. A type collection is a collection of coins formed by one example (usually one of the most common dates) of each type of coin. Type coin	 A representative coin, usually a common date, from a particular issue of a specific design, size, or metal. Type One	 Term for any coin from the first Type within a Series. Type One Buffalo	 A 1913-dated Indian Head nickel with the reverse bison on a raised mound. Type One Gold Dollar	 The Liberty Head design gold dollar struck from 1849 until mid-1854 in Philadelphia and for the full year in Dahlonega and San Francisco. Type One Nickel	 The Jefferson Head five-cent coin struck from 1938 until mid-1942 and from 1946 until today. Also may refer to the Type One Buffalo nickel. Type One Quarter	 The Standing Liberty quarter struck from 1916 to mid-1917. Type One Twenty	 Liberty Head double eagles struck from 1850 until mid-1866. These coins did not have a motto on the reverse and had “TWENTY D.” as the denomination. Type Three	 Term for any coin from the third Type within a Series. Type Three Gold Dollar	 The Small Indian Head design struck from 1856 until the series ended in 1889. Since the San Francisco Mint did not receive the Type Three dies in time to strike the new design in 1856, the coins from that Mint are Type Two style. Type Three Twenty	 Liberty Head double eagles struck from 1877 until the series ended in 1907. Type Three coins have the motto “IN GOD WE TRUST” on the reverse and read “TWENTY DOLLARS” for the denomination. Type Two	 Term for any coin from the second Type within a Series. Type Two Buffalo	 An Indian Head nickel struck from mid-1913 until the series ended in 1938. The reverse bison is shown on level ground. Type Two Gold Dollar	 The Large Indian Head design gold dollar struck from mid-1854 until 1855 in Philadelphia, Charlotte, Dahlonega, and New Orleans. Since San Francisco did not receive new dies before the end of 1856, they struck Type Two coins during that year. Type Two Quarter	 The Standing Liberty quarter struck from mid-1917 until the series ended in 1930. This design features a Miss Liberty with a covered breast, three stars under the reverse eagle, and a more intricate head design. Type Two Twenty	 Liberty Head double eagles struck from mid-1866 - 1876. These coins have the motto “IN GOD WE TRUST” on the reverse and “TWENTY DOL.” as the denomination. Ultra High Relief	 Alternate name for the Extremely High Relief. Ultra rare	 A coin or other numismatic item that is represented by only a few examples. Used	 Term used to describe a coin that has light to heavy wear or circulation. VAM number	 Unique number (such as VAM-105) assigned to each set of Morgan and Peace dollar dies documented in The Complete Catalog and Encyclopedia of United States Morgan and Peace Silver Dollars. Abbreviated VAM because of the authors Leroy Van Allen and A. George Mallis. Van Allen-Mallis	 Authors of The Complete Catalog and Encyclopedia of United States Morgan and Peace Silver Dollars first published in 1971, and reprinted in 1998. Variety	 A coin of the same date and basic design as another but with slight differences such as variations in date, mintmark size and placement. VDB	 Synonym for the 1909 VDB Lincoln Head cent. Controversy arose over having a non-Mint engraver’s initials on a coin, so Victor D. Brenner’s initials were removed. In 1918, the VDB was returned to the Lincoln Head cent in a less conspicuous spot on the slanted area at the bottom of Lincoln’s shoulder. Very Fine	 Term for the grades VF-20, 25, 30, and 35. Very Good	 Term for the grades VG-8 and VG-10. Vest pocket dealer	 A part-time coin merchant. VF	 Acronym for Very Fine. VG	 Acronym for Very Good. Walker	 Synonym for a Walking Liberty half-dollar. Walking Liberty	 Synonym for a Walking Liberty half-dollar. Walking Liberty half dollar	 U.S. half dollars struck from 1916 - 1947. War nickel	 Synonym for Wartime nickel. Wartime nickel	 Five-cent coins struck during World War II with the composition 56% copper, 35% silver, and 9% manganese. Historic legend has it that the metallic change was driven by a need for nickel to be used in the war effort. However, recent research indicates that the boost to morale by having an intrinsic-value small denomination coin may have played an important part in the issuance of the Wartime nickel. Washington quarter	 Synonym for the Washington quarter dollar. Washington quarter dollar	 Quarter dollar first struck in 1932, as a circulating commemorative coin to celebrate the two-hundredth anniversary of George Washington’s birth. It was designed by Laura Gardner Frazier and was a continuing series from 1934 through 1998 (with a special Bicentennial reverse in 1976). For 1999, the obverse was redesigned and the State quarter series begins. Each of the 50 State quarters will have a different reverse design with 5 new issues per year. Watery look	 Term for the wavy finish seen on the surfaces of most close-collar Proof coins. Weak strike	 Refers to a coin that does not show its intended detail because of low striking pressure or improperly aligned dies. Wear	 Visible erosion of metal, usually beginning from the highest points of a coins. Eventually, lettering, details, or entire devices are obliterated. Wear should not be confused with a weak strike. It is possible for a worn coin to have more detail than a weakly struck mint state coin. Whizzed	 An artificial process whereby the surface of a coin is buffed to give it the appearance of having natural cartwheel lustre. Wire edge	 An effect whereby a thin, wire-like section of the rim of a coin is raised above the rest of the rim along the outside. This effect is typically caused by very high striking pressure, and tends to occur mostly on proof and high relief strikings. Wire Edge eagle	 The 1907 Indian Head eagle coin of which only 500 were struck. Technically a pattern, this design featured a fine wire rim and surfaces that were both satiny and striated. An unknowledgeable numismatist will look at one of these specimens and consider it hairlined or harshly cleaned. Wire Edge Ten	 Synonym for the 1907-dated Wire Edge Indian Head eagle. Wire rim	 Synonym for wire edge. With arrows	 Alternate term for arrows at date. With arrows and rays	 Synonym for arrows and rays. With motto	 Alternate term for motto. With rays	 Alternate term for rays. Working die	 A die created from a working hub that is used to strike coins. Working hub	 A hub created from a master die that is used to create the working dies. World Coins	 Coins from countries other than the United States. Worn die	 A die that has lost detail due to extended use. Dies were often used until they wore out, or were excessively cracked or broken. Coins struck from worn dies often appear to be weakly struck, however, they are not caused by low striking pressure. Wreath cent	 Synonym for the second large cent type of 1793. XF	 Abbreviation for Extremely Fine. Zerbe Proof	 Morgan dollars specially struck in 1921 for numismatist Farran Zerbe. The NumisMedia Online Fair Market Value Price Guide (all grades, Good through MS70) is FREE to all visitors and does not require a password. 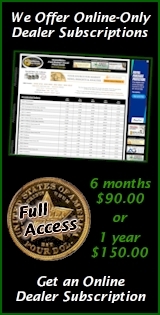 NumisMedia Price Guides are constantly changing and updated daily. NumisMedia accepts PayPal. You can pay instantly even without a PayPal account. For credit card payments by fax or phone (Visa & MC only) include card info, full name and billing address of card. Make check payments out to 'NumisMedia' and send to the address above.